The new "Mass Effect 2" picks up the story as the lead character, named Shepard, has been brought back to life. (CNN) -- When you finish one video game in a series and begin the next, you're basically forced to start from scratch without carrying over any of your accomplishments from the previous game. But the popular "Mass Effect" sci-fi action trilogy aims to change that -- by allowing players to complete one game and transfer their character to the next one in the series. It is an ambitious project that involves nearly 35,000 lines of dialogue. "We wanted to create the biggest story we could tell," said Casey Hudson, BioWare's project director for "Mass Effect 2" and executive producer of the "Mass Effect" franchise. The just-released "Mass Effect 2" picks up the story as the lead character, named Shepard, has been brought back to life after a devastating attack by an invading race of machines bent on eliminating organic life. The action takes place shortly after the events of the first "Mass Effect," which was set in the year 2183 in the Milky Way galaxy. In a rare twist, players who played the first "Mass Effect" game are being given the opportunity to import their characters into the new game along with all their rewards, romances and consequences. Hudson said his team tried to create a fictional universe that players could explore over long periods of time to "have an epic experience." By carrying over the data from the original "Mass Effect," Hudson's team tried to show the consequences of characters' choices. But by accounting for so many variables in the first games, Bioware was faced with a daunting task going forward. "We used tech skills we developed going back to 'Baldur's Gate' [in 1998]," Hudson explained. "Writing for 'ME2' was the hardest thing we've ever done." "Mass Effect 2" has 15 to 20 percent more dialogue and 30 percent more key decisions -- choices that affect the game's outcome -- than the first game, said Hudson, who believes the voice acting in the new game is more movie-like than the first one. "It took several months of voice work, and often we would bring back an actor to get the right inflections for the character and the scene," he said. "There are hundreds of characters in the game that needed voices." Although "Mass Effect 2" is being billed as a dark second chapter in the trilogy, there are laugh-out-loud moments of dialogue. Playing the game reveals that even its tense moments are given a softer edge with unexpected comic exchanges between characters. For example, in one scene, Shepard tries to persuade a character not to follow orders that could lead to a "suicide mission." Without missing a beat, Shepard's squad mates look at each other as one says, "We can ignore suicidal orders? Why wasn't I told about that?" 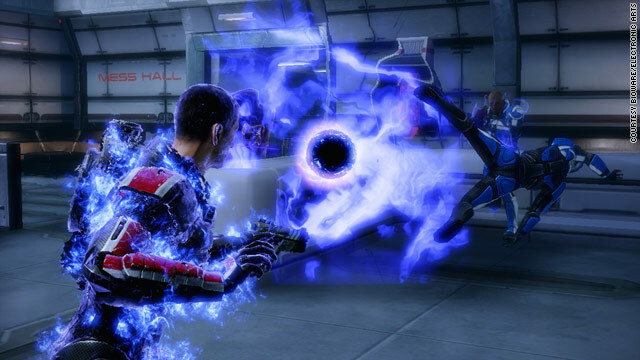 "Mass Effect 2" also offers players the opportunity to interrupt a conversation and create a whole new path. During a scene when another character is talking, icons will appear to let you change the conversation with a Paragon move (good) or Renegade move (bad). Side plots tie into the main story more than in the first game, so even these chat-interrupting choices could have an impact later on. "Things can happen in conversation," Hudson said when asked about the interrupt feature. "It makes the conversation feel alive." Work has already begun to complete the final chapter of the "Mass Effect" trilogy. And gamers shouldn't assume that Shepard makes it to the end of "Mass Effect 3." Hudson said Shepard can die a final death if the player makes wrong choices or inspires bad loyalty from his crew. "We made it so you'll still get a satisfying ending, but yes, Shepard can actually die," he said.